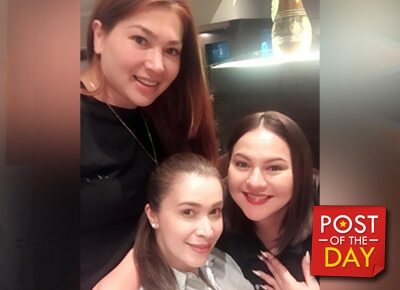 Sunshine Cruz, Karla Estrada and Jackie Forster took some time off their busy schedule and had a get together. Sunshine Cruz, Karla Estrada and Jackie Forster took some time off their busy schedule and had a get together. The actresses were happy with their mini-reunion and posted it on Instagram. Actors who signed up with Lily Monteverde's Regal Films (now known as Regal Entertainment) are known as “Regal Babies." Finally able to catch up with my Regal Films batchmates (Regal Babies of the 90's) Sayang Shirley Fuentes wasn't able to make it. It was so nice to catch up with you @jackie_forster and @karlaestrada1121 and I'm delighted to be able to meet and hug #kikayCaleigh. ? ?